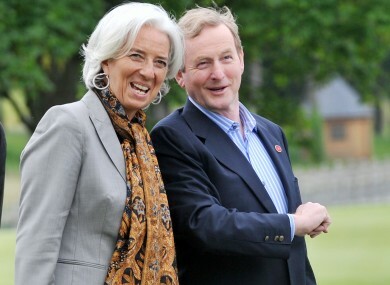 Head of the IMF Christine Lagarde with Taoiseach Enda Kenny, pictured at the G8 summit earlier this year. THE INTERNATIONAL MONETARY Fund has published its twelfth and final review of Ireland’s bailout. The report describes the programme as being “completed successfully”, but stresses a number of challenges still facing the economy. Criticisms include a high level of public debt, an ‘unacceptably’ high level of unemployment, and banks being ‘weighed down by low-yielding mortgages’ and non-performing loans. Writing in the report, IMF Chair Christine Lagarde praised Budget 2014, saying it put public debt on a declining trajectory. She stressed the need to tackle unemployment and offer more “training for jobseekers, together with steps to promote credit for SMEs”. Lagarde said the programme’s success was down to “steadfast policy implementation” by the government, and we leave the programme with a range of positive indicators. Email “That's all, folks: IMF praise Ireland, but lay out important challenges”. Feedback on “That's all, folks: IMF praise Ireland, but lay out important challenges”.